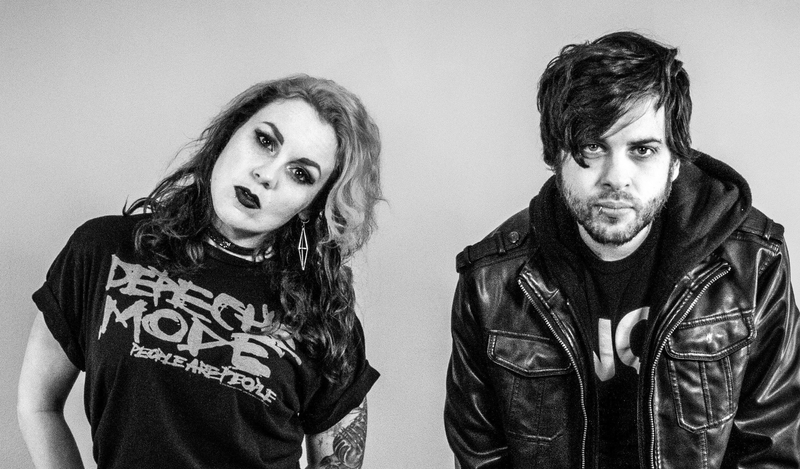 Jacksonville-based electro-rock duo Dancing With Ghosts have released a new music video for their single “Eyes Wide Open,” out on YouTube NOW. The music video follows the release of their recent LP “Hex,” where the duo experiments with sleek synth production and modern rock influences on all 14 tracks. “Eyes Wide Open” gives a strong visual to the band’s sinister branding, while simultaneously bringing the album to life. The wide range of topics discussed on “Hex,” including a slew of emotions centralized around mental illness, put Dancing With Ghosts on a platform to bring light to this era of darkness. Dancing with Ghosts is an electronic-infused alternative rock band from Jacksonville, Florida. The band was started by Josh Cannon back in 2015. After multiple attempts to work within a traditional band dynamic, Josh ventured off on his own and began writing, recording and performing his own music. In 2017, Stephanie Conner joined the band a few months after Dancing with Ghosts’ first full length release: “Koyaanisqatsi”. Stephanie contributed her vocal talents on the band’s second album, “The Nightmare Inside You”, which was released in March of 2018. Along the way, Josh and Stephanie have been producing numerous music videos which have garnered thousands of views on their YouTube channel. Josh and Stephanie have taken a “do it yourself” approach to every aspect of the band which is something they take great pride in. As a result of a successful podcast Josh hosts (Uncovering Unexplained Mysteries), Dancing with Ghosts have passionate fans all over the world. Their new album “Hex” is available NOW on all digital and streaming platforms.